After several closes below 15, the VIX is starting to make a strong move back to 20. VIX: 17.83 +0.77 (+4.51%) I noted in a recent post that the VIX was still in an Unstable Vix Pattern formed by an August 2007 Trigger Event. I noted then that the movement below 15 could be a sell signal accompanied by a need to buy hedges for long positions. If the trend below 20 continued until September 25th, then the movement below 15 would be a long term buy signal VIX Asset Allocation Model Update It remains to be seen which way the worm will turn under this model. There are reasons to be pessimistic about the near and intermediate term future, but there are always good reasons for pessimism. I recall August 1982, the start of the last long term secular stock bull market, and the pessimism then was both prevalent and easily a majority position. But, the deep thinker types would see that the framework for a long term bull market was already in place. The Federal Reserve had squeezed inflation out of the economy, interest rates were still high but going down, and the computer revolution would drastically improve productivity. The investor did not need to focus on the here and now, but simply digest those big picture events and then act accordingly. The underlying main problem now is not inflation but debt, both at the consumer and government levels. Underlying Cause of the Current Long Term Bear Market is Too Much Debt (June 2010 Post) That problem involves a few developed nations rather than the primary emerging market nations. The U.S. government is one of those offenders and has made no progress in reducing its out of control budget deficits. There is progress being made in several European nations, the other primary offenders in the government category. American consumers, the primary offender in the consumer category, are making decent headway in improving their balance sheets. It would be extremely important for housing prices to continue an upward trend. Unlike August 1982, however, I can not say now that the underlying problem has been whipped, since one of the primary offenders, the U.S. government, has yet to address its debt and deficit problems. Our government is the whale in a china shop, not Greece. I may be overestimating the near and intermediate term dangers associated with U.S. government debt levels. My perception of the risk is way out of line with investors who are showering the U.S. government with money, willing to accept rates that will probably fail to earn them any return after inflation. One "principal protected note", Citigroup Inc. 3.00% Minimum Coupon Principal Protected Notes based on S&P 500 (MYP), has been exhibiting bizarre and irrational behavior worthy of a commitment proceeding. I would place a current maximum value on that note of $10.4. I personally would not buy it at $10.40. Maybe I would buy a 100 at $10.20 to $10.3. If I owned 100 shares, I would have sold the entire position at the prices prevailing on either 8/29 or 8/30. 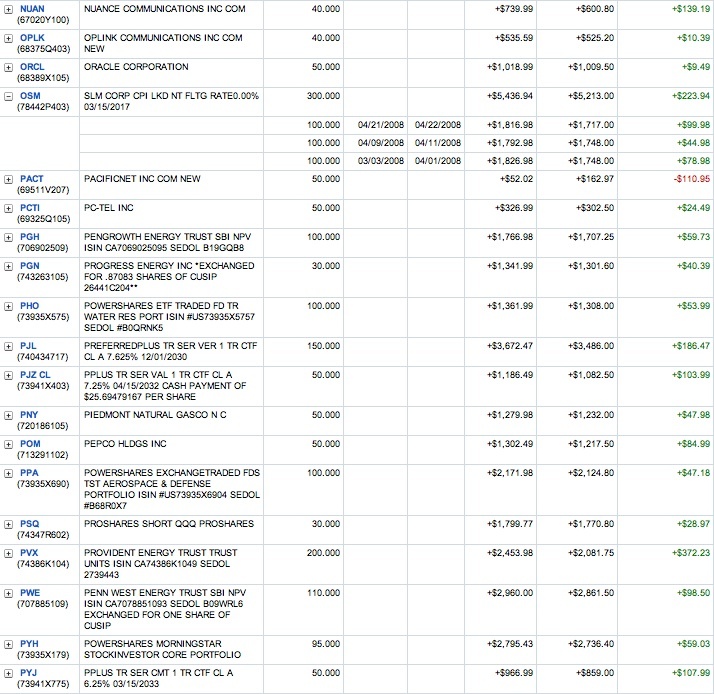 MYP had no trades on 8/28 and traded just 400 shares on 8/27, all of which were at a $10.75 price. MYP Historical Prices On 8/29, the price surged to $12.30 with 9600 shares exchanging hands with an intraday high of $12.38. Yesterday, the shares closed at $13, a 30% premium to the $10 per share par value. Bizarre does not begin to describe this action. A single close in the S & P 500 above the Maximum Level (1,811), on or before the End Date, would cause a Maximum Level Violation and a reversion to the minimum coupon, irrespective of the S & P's value on 4/23/13. The S & P would have to be above 1,413.13, as of the 4/23/13 close, to even trigger an increase in the 3% annual coupon ($30 per 100 shares), and that would occur only when there is no Maximum Level Violation during the coupon period. The S & P is not even above that level now. This is just simple math, with a small dose of common sense. To justify a $13 price now, an investor would have to be 100% certain that the S & P would close almost at its maximum level of 1811 on 4/23/13 without a single close above that level during the current annual coupon period. Even if one assumed that would happen, and no one in their right mind would, this security would pay only $3.12 on its $10 par value at a End Date price of 1800 on the S & P 500 with no Maximum Level Violation. Even if you knew in late April 2013 that MYP was going to pay $3.12, based on a S & P 500 close of 1800 on 4/23/13, an investor would not be getting a good deal at all by buying 100 shares at $13 even in an IRA. An investor can not value these securities based on such an asinine and absurd assumption about a future event almost eight months away. This security could end up being worth only a few cents more than its $10 par value at maturity if it ends up paying just its minimum 3% annual coupon for the two remaining annual payments! I review the Dividend page at the WSJ every weekday night. I noticed that France Telecom will go ex dividend on 9/4 for a $.70941 distribution. I will only own French companies in either my Fidelity or Vanguard brokerage accounts. Item # 2 FTE Dividend-Withholding Tax; Item # 2 Sold 105+FTE. Those were the only two firms that applied for tax relief at the source that reduced France's withholding tax to 15% from 30%. I currently own 100 shares of FTE. I also own several CEFs that will go ex dividend on 9/4/12, including RVT, FUND and RMT for quarterly dividends and two (IGD and FAM) that pay monthly. One of my regional banks that pays a good dividend, UVSP, will also go ex dividend on 9/4. I decided to create a new investment category which I will call "The $500 to $1000 Flyers Basket Strategy ". Just what the world was waiting for, another investment strategy hatched by the OG and the Nitwit RB. Due to the considerable uncertainty about the near term future, and an overall positive view about the intermediate and long term, a number of selections are likely to fall into this price range. My VIX model may flash a green light in about a month or the VIX may surge again to over 20 based on the usual list of fears. As with the Lottery Ticket Basket Strategy, which as a maximum of $300 plus any prior profits from the security, this strategy will control risk by limiting the amount of the investment to an insignificant amounts for me. The strategy will include both ETFs and individual security selections. Some of the ETFs may be in sectors or investment styles that are currently out of favor with the crowd. The individual security selections will generally be higher quality names than those selected for the LT strategy. However, as with LT selections, some of those selections will justifiably look like I am trying to catch a razor sharp falling knife, including the one discussed in Item # 2 below. As with other basket strategies, the success will be dependent on how the overall portfolio performs rather than one or even a few components. Given the small amount devoted to each selection, I can afford to be patient in case it takes a long time for the investment to pay off. Since a few recent selections fit within this category, I will include some of those in this basket. An example would be the ETF TDIV. Bought 50 TDIV at $19.95 (8/28/12 Post). I will not post a table until I have at least 20 selections. I may include a couple of more ETFs after I sell 50 shares to bring them within the dollar limit of this basket strategy. An example would be the ETF LIT which contains a large number of companies that are currently way out of favor, including all of the battery companies owned by that fund. 1. Bought 50 of the ETF FVL at $12.95 Last Wednesday (The $500 to $1000 Flyers Basket Strategy)(see Disclaimer): This ETF is certainly out of favor and has an ignominious 1 star rating from Morningstar. That may be a tad harsh. I would not give it more than 2, however, given its past performance. This ETF will include the 100 stocks rated 1 in timeliness by Value Line, hence the name First Trust Value Line (R) 100 Fund. 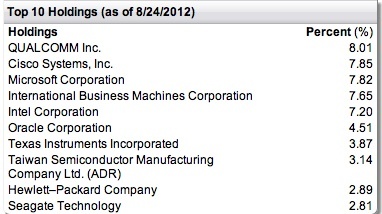 For those unfamiliar with this system, VL ranks 1700 stocks with a timeliness ranking of 1 (highest) to 5 (lowest). One hundred stocks are given a timeliness rank of 1, and VL will make changes to those rankings on a weekly basis. The fund will rebalance quarterly. FVL will be rebalanced on the last Thursday of each quarter. The expense ratio is high at .7%. I suspect some of that money has to be paid to VL for the use of its name and index. The Value Line method for picking stocks has its detractors. It is a quantitative method. While I do not know all of the factors used by that firm or the weight given to each factor, I believe that VL is using a momentum based model that relies heavily on price and earnings. This model seems to work better in long term stock bull markets and is less desirable during long term secular bear markets. That is just a personal observation/opinion. I am not now, nor have I have been, a "quant" or a "momentum" investor. Actually, most people would describe the OG as a "deep value" and "anti-momentum" investor, which also has its drawbacks including but not limited to the "value trap". In addition to the Morningstar site, the historical distributions can be found at FVL Distributions. Having noted this problem, one cure for tax inefficiency is to have a large capital loss carryforward that would shelter future gains. The 2011 annual report shows that FVL manage to realized capital losses of $91.553M, of which $47.8+M expires in 2016 and another 29.477+M in 2017. ftportfolios at page 111 The downside is that realized capital gains will probably not be distributed to FVL shareholders to the extent they are offset by the loss carryforwards. At least the loss carryforwards could make the fund more tax efficient for several years, assuming it can start generating large profits rather than losses. And to generate those large profits, the fund would need a lot more money than it has now. Outflows have been the recent norm. Another issue is that the selections are not good dividend plays for the most part. There were no dividends paid by FVL between 2008-2010. And only a very modest income dividend was paid in 2011 and so far in 2012. I will probably hold this one for several years, just to see how the VL system works in practice. I really just do not remember any of the foregoing, just one big blur, but I can see now what I was doing and why. 2. Bought 50 VALE at $15.9 Last Wednesday (The $500 to $1000 Flyers Basket Strategy)(see Disclaimer): The bear case for Vale is well understood. There are two major problems. Its main product is iron ore which is crashing in price. This article at Seeking Alpha goes into details. Prices for other metals have also been hurt by a deceleration in China's economy and the ongoing recessionary conditions in Europe coupled with sluggish U.S. growth. Vale is the second largest producer of nickel, manganese and ferroalloys. It also has coal, copper, fertilizer, cobalt, and steel operations. It is the largest provider of logistics and transportation in Brazil due to its ownership of railroads and ports. The other problem involves Brazil's government and that issue caused me to sell 100 shares last year. 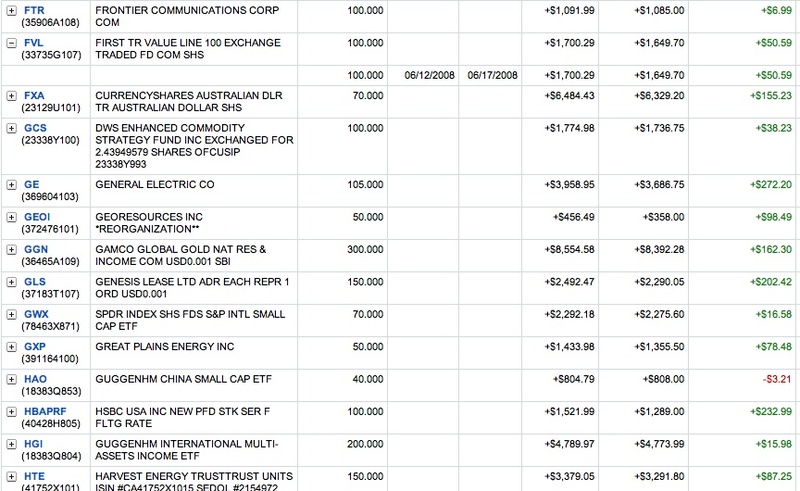 Item # 2 SOLD 100 VALE at $34.6 I never view a significant government stake in a private company positively. And, when the government has a controlling stake, the potential for mischief and undesirable meddling is high. This concern will become acute in Latin America, where leftist governments will frequently use companies as a source of funds and political patronage. As shown by some recent activities in Argentina, a government takeover is not out of the question. I view the Brazilian government's hostility to capitalism to be comparable to Argentina's government, though not as extreme at the present time. Argentina is possibly a notch or two better than the Hugo Chávez administration in Venezuela. Some of the political risk in Brazil is demonstrated by the government claiming an additional $15.19 billion in taxes on Vale's overseas profits, and a demand for $1.98 billion in additional royalties. Reuters In short, Brazil views the company as a honey pot to raid whenever the leftist politicians want more money. The tax issue is currently before Brazil's Supreme Court. An adverse decision by Brazil's Supreme Court could easily send the shares down significantly. Conversely, the price could also jump if Brazil's Supreme Court squashed the government's effort to collect that $15.19B. I believe that Vale lost in the lower courts (SEC 6k) and is arguing that the government's position is violation of Brazil's Constitution which prohibits double taxation. That would be a good amendment for the U.S. Constitution. This kind of political climate will cause investor's to head for the exits in droves, and that stampede will only accelerate if and when Brazil succeeds in crippling Vale's expansion prospects with these kind of demands. The downturn in profitability adds fuel to the fire. Given this extremely adverse political climate and a significant downturn in prices for the commodities produced by Vale, I would not buy more than 50 shares even at the current depressed price. The last bottom after a huge downdraft was hit near $10 late in 2008. I suspect that bottom may be tested if Vale has to pay another $15B in taxes. The most recent top was around $36 in January 2011 and it has been mostly downhill since that high. Possibly, it would have made more sense to pick up this small position with the share price nearer $10. When catching a falling knife, sometimes it pays to wait until the point of maximum pessimism is reached by investors, marked by a wholesale dumping of the security. It is hard to know one way or the other. I do know that a buy of 50 shares at $15.9 looks a whole lot better than continuing to hold until now those 100 shares sold at $34.6 last year. Given the uncertainty about Vale's profitability and the political situation, however, I would not count on future dividends being paid, let alone paid at the current rate. I did read a few reports before purchasing the shares. S & P rates the shares at 4 stars with a $24 12 month price target. That target is probably to high for 12 months. A $24 price in 24 months may be more realistic. Morningstar has a 4 star rating on VALE and a consider to buy price, which may prove to be about right, at less than $13.9. This is a link to the 2012 second quarter report filed with the SEC. Net sales fell 21% to $11.9B. Operating earnings per ADS fell to 60 cents from $1.22. If I receive a decent pop in these shares to over $20 within the next six months, I would seriously consider harvesting that profit plus the one dividend payment. An article in Kiplinger summarizes some of the requirements for refinancing underwater homes. Sears Holdings (own bonds) announced that it will distribute transferable subscription rights to purchase common stock of Sears Hometown at $15 per share to the owners of Sears common stock. The distribution of the subscription rights will be made to Sears stockholders of record on 9/7/12. Sears hopes to receive $446.5M relating to this offering, of which $100 million would be a dividend paid by Sears Hometown to Sears Holdings prior to its separation. I own 4 senior secured Sears Holdings bonds maturing in 2018. The government sold five year notes yesterday with a yield of .708%. There is an ETF, traded on the Toronto exchange, that attempts to follow Gartman's investment strategy. HAG Horizons Gartman ETF The performance has not been good. The ETF lost 16.9% in 2011 and is up only 3.1% or so this year which is not inspiring either. The IPO was at $10 back in March 2009 and the shares are trading below $8 now. There have been no distributions. I do not own it, and have no plans to buy it. Citigroup agreed to settle a class action suit for $590M that accused the bank of hiding its toxic assets. Citigroup had some of the dumbest Masters of Disaster before the onset of the Near Depression. There is no question that those nitwits would have sunk the bank without massive government assistance. Some of that idiocy is explore in a 2008 article published by the NYT. A long term chart reveals the damage done by those Masters of Disaster: Citigroup Interactive Chart The prices in that chart are adjusted for a 1 to 10 reverse split. Needless to say, Masters of Destruction will profit from their annihilation activities, a result that goes far beyond disgusting. 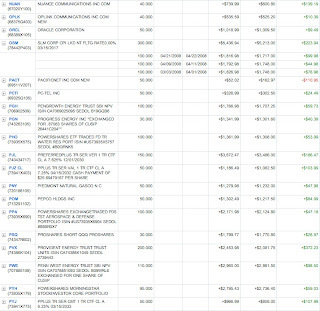 I do not own the common but I do have exposure to ten $1,000 par value, senior unsecured "principal protected" notes issued by Citigroup Funding, and guaranteed by Citigroup, that mature in 2014 (see list in yesterday's post). When I last purchased the Yorkville MLP ETF, I mentioned that Jason Zweig had written a negative article about royalty trusts. ADDED 100 YMLP at $18.7 Zweig referred to a recent SEC filing by BP Prudhoe Bay Royalty Trust (BPT), wherein the trust estimated that the present value of its income distributions was $1.4 billion. Royalty trusts do not have employees, nor will there be any effort to replace production. The investor only has a future income stream that will be depleted over time. While I would profess ignorance about FASB 932, and have zero interest in learning more about this accounting rule, I would assume that the present value calculation would be similar to a bond's make whole calculation. The interest rate used in that discount calculation will change as will the price of oil. Production amounts may also change. All of those factors would increase or decreases the estimate value of the future income stream discounted to present value. Having made that statement, I would judge the present value estimate made by the company to be a useful yardstick in evaluating the current value of BPT shares. It would be hard to justify paying more for that income stream than the current estimated present value in my opinion, unless the investor is both a yield hog and a trader. I do not own any royalty trust directly. I would not have selected either BPT or SJT for inclusion in the MLP ETF YMLP, at anywhere near the prices that the managers of that fund had to pay for those securities. As noted in a recent Bloomberg article, ten old white men are contributing 1/4 of the $350 amassed so far by "conservative" PACs who are trying to elect Romney and other republicans. Those individuals claim to be interested in GOP "principles" but it would not be outlandish to postulate that their true interest is to receive a huge return for themselves on that investment. An article in the NYT highlights how the GOP has moved further to the right by simply comparing their 1980 and 2012 platforms. The GOP is no longer a conservative party, but an extreme reactionary one. In that context, reactionary means rolling back progressive legislation by decades. In many cases, the rollback would be at least 60 years. The embrace of True Conservative principles is lacking and frequently in name only. Being closed minded and intolerant are not conservative principles. There are more conservative principles embodied in the Bill of Rights than just the right to bear firearms. There is nothing conservative about Mitt Romney having a similar tax rate as a factory worker, or allowing the Koch brothers to pollute the environment to earn more profit for themselves. I will give equal time to watching both the GOP and Democrat conventions. I will not watch a second of either. I will read what fact checkers have to say about the misrepresentations and outright falsehoods made by the politicians at those confabs. Lying works in politics because millions are ignorant, stupid and/or gullible. It took a long article for FactCheck.org to summarize the GOP's false and misleading statements from just the first day. I spent some time last Tuesday buying shares in companies where long term and patience are the operative words. 1. Bought 50 BZH at $2.92 Last Tuesday (Lottery Ticket Basket Strategy)(see Disclaimer): I do not have much faith in Beazer Homes turnaround potential. I would only guess that such potential exists over a long period of time. This homebuilder's stock was deservedly crushed during the Near Depression period. No sector of the economy was hit harder than the market for new homes. And, at the present time, I would just say that there is some light flickering at the end of a dark tunnel for homebuilders. Possibly, the worm is starting to turn in their favor, but it will take several years before the market returns to something resembling the boom years. I am obviously not expressing much confidence with a 50 share buy at $2.92. One characteristic common to lottery ticket buys is a smashed share price. Beazer's stock certainly qualifies under that criteria. During the last boom period, the stock rose from around $6 per share in early 2000 to a high near 73 before the housing bubble burst. BZH Interactive Chart If Beazer can survive the current slump, I seriously doubt that it will return to its former highs in my lifetime. It does not have to repeat that move for this LT buy to be successful. I would be extremely pleased with a $10 share price in five years. There is not any optimism that BZH will turn a profit anytime soon. The current consensus estimate is for a $1.12 loss in the F/Y ending in September 2012 and a 61 cent loss in 2013 fiscal year. BZH Analyst Estimates It would not take much of a profit, along with a surge in new orders, to cause a pop in the stock given this kind of pessimism. (a recent example of a 100%+ pop after a quarterly profit would be Frozen Food Express). While I would not expect that to happen this year, I would not be completely shocked to see the company return to profitability in 2013. Company Website: Home Builders | New Homes from Beazer Homes As shown on a map at BZH's website, it has operations in Middle Tennessee. There was much of a positive nature to say about the last quarter. BZH-6.30.2012-Q3 Document The company lost $39.056M or 38 cents per share from continuing operations, which was a major improvement from the 75 cent loss in the year ago quarter. The company has a lot of debt (p.15). On a brighter side, backlog increased 32.8% and new home orders rose 29.8%, see page 37. I am aware that JP Morgan recently raised the stock to outperform from underweight. As with other LT purchases, it would not be rational to expect immediate gratification. These selections are dicey and their potential, if any, may take years to develop. 2. Added 50 Alcoa at $8.51 Last Tuesday (see Disclaimer): I had a $1,000 profit in my Alcoa position but let it slip away since my $20 target price was not hit. I could have sold the position at $18 in April 2011. AA Interactive Chart Now, due to the mistake of grasping for an extra $2 per share, I am now sitting on an unrealized loss of close to $800. My average cost per share is $10.69. My first two purchases were made during the Dark Period at $11.49 and at $5.6. The first buy was made during the Apex of the Dark Period, October 2008, which just highlights how negative investors have turned on AA shares now. I am reinvesting the dividend to buy more shares. The quarterly dividend is only 3 cents which is almost buying me one share at the current price. The dividend yield is about 1.4% at the current price. The main problem now for Alcoa shareholders is the steep decline in the aluminum price. For the period between 5/1/12 and 8/28/12, the LME average price was about $1,904 per ton. (TEXT-S&P: Alumina Ltd. ratings lowered to 'BBB-'; outlook stable: 60% owned by Alcoa). Part of the problem is that a number of Chinese smelters continue to operate notwithstanding their inability to earn a profit. I view that price drop as temporary, not in the sense of weeks or months, but temporary when measured in a longer increment of time such as a year. Maybe 2013 will be start of a cyclical upturn in price, or maybe it will be 2014 or even 2015. I simply view it as likely that a cyclical upturn lasting several years will occur before 5 years and probably sooner. The market is pricing Alcoa shares as if that upturn could not occur during the next five years and probably will even start to happen within five to eight years as my rough estimate. So, we will see who is the better forecaster. My second perspective on Alcoa is that it has become a better company now than when it was priced at $40 a share. An investor reading brokerage reports on this company will form that opinion quickly and easily. Morningstar has a five star rating on Alcoa shares and a consider to buy price at $11.4 or less. The Morningstar report and others highlight Alcoa's downstream businesses (e.g. engineered & flat rolled products) are producing stronger profits and revenues now compared to the pre-Near Depression period. And, Alcoa has taken and continues to take measures to improve productivity and to shut or curtail unprofitable operations. Another potential area for share price appreciation is price for Alumina, which is use by smelters to produce Aluminum. Alcoa is the largest seller of Alumina. It is vertically integrated in the production of Alumina given its bauxite mining operations. Alcoa: Worldwide: Markets: Alumina: Overview Bauxite is refined into Alumina. It would be important for the Alumina price to become more de-linked from the aluminum price, particularly since Alumina is a more scarce product. At a $8.5 price, the shares are trading at .67 to book value and at a price to sales ratio of .37. AA Key Statistics The current consensus estimate is for an E.P.S. of 29 cents per share in December 2012 and $.74 in 2013. Unlike a consumer staple company, where an E.P.S. forecast will likely be close, an estimate for Alcoa's 2013 earnings has be be taken with a grain of salt. A reasonable range might be anywhere from 40 cents to a buck per share. If you could tell me the average price for aluminum throughout 2013, I could narrow that range considerably. I discussed AA's last earnings report at Item # 4 Alcoa, along with some negative analyst commentary that has helped sink the price. Alcoa does have non-core assets that it can sell. I previously mentioned Alcoa's agreement to sell its Tapoco hydroelectric generating station, along with associated land and transmission lines, for $600M. I going to revise my trading strategy for Alcoa. I will sell 50 shares when and if the price returns to $13+. I will sell all but 50 when and if the price returns to $18. And, if both of those events happen, I will try to keep the last 50 shares for a ride to over $25. The Case-Shiller 20 city home price index rose 2.3% in June. Along with the upwardly revised number for May, the two month gain was the strongest advance in home prices since this data series started over a decade ago. All twenty metropolitan areas showed price gains for the second consecutive month. Several areas experienced more than 4% increases in June compared to May, including Atlanta (+4.4%); Chicago (+4.6%); Detroit (+6%); and Minneapolis (+4.8%). S & P revised its debt rating outlook for Quicksilver resources from negative to positive. 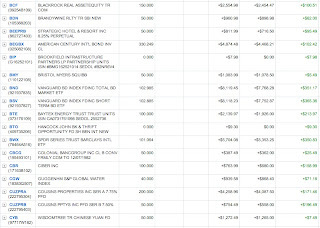 TEXT-S&P I own 3 unsecured senior bonds. S & P kept both its CCC+ rating on those bonds and its 5 recovery rating. A 5 recovery rating is S & P's estimate that the senior unsecured bond owners would recover 10-30% after a default which is far from comforting. 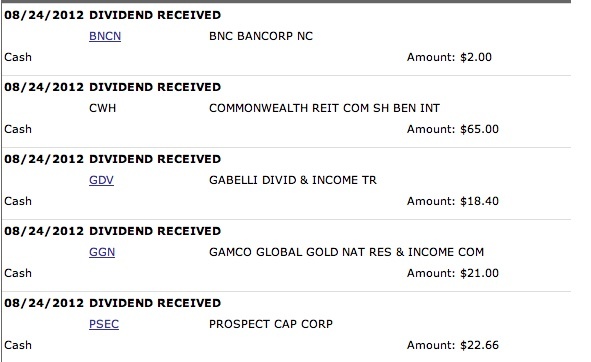 Two of my Canadian bond funds were ex dividend yesterday for their monthly distributions. iShares 1-5 Year Laddered Government Bond Index Fund (CLF-TOR) (own 700 shares); and iShares 1-5 Year Laddered Corporate Bond Index Fund (CBO-TOR) (300 shares). Another Canadian ETF, which is weighted in bonds, was ex dividend on 8/24/12 for its monthly distribution. Diversified Monthly Income (XTR) Distributions - iShares Canada ETFs (own 500 shares). The Federal Reserve has turned into a money making machine for our destitute Uncle Sam. In 2011, the Federal Reserve returned to the treasury a $76.9 billion profit Forbes The Federal Reserve reported that it realized a profit of $47.5 billion for the first half of 2012. Federal Reserve Quarterly Financial Report for the Q/E June 30, 2012 The RB had an idea. Why not let Uncle Ben do his thing for another ten years and maybe he will be able to create a budget surplus, assuming the GOP is successful in throwing the middle class and the poor under the train with their spending cuts, for their own good to be sure, and that more tax cuts for the Koch brothers and other billionaire "Job Creators" actually creates jobs this time around. 1. Bought 100 MOL at $9.78 Yesterday-Roth IRA Gold is starting to show some life again as investors grow more confident about more central bank money creation. One of the less desirable "principal protected" notes is the Citigroup Funding Inc. 2.00% Min Coupon for Gold (MOL). The reason for adding 100 shares will be discussed near the end of this section. This unsecured senior note has a $10 par value and matures on 11/26/2014. The coupon is the greater of 2% or up to 19%, based on the price of gold. This note is less desirable due to its low permissible percentage gain. This low number of just 19% will more likely result in a Maximum Level Violation during a coupon year compared to one with a 30% or 35% maximum gain. MTY is a similar note to MOL with a 3% annual coupon and a 35% maximum. Final Pricing Supplement I own 200 of MTY. Since this note has at a minimum three 2% annual coupons between now and November 2014, the minimum annualized yield is close to 3% at a total cost of $10. My minimum yield is juiced slightly by buying the note at a small discount to its $10 par value. 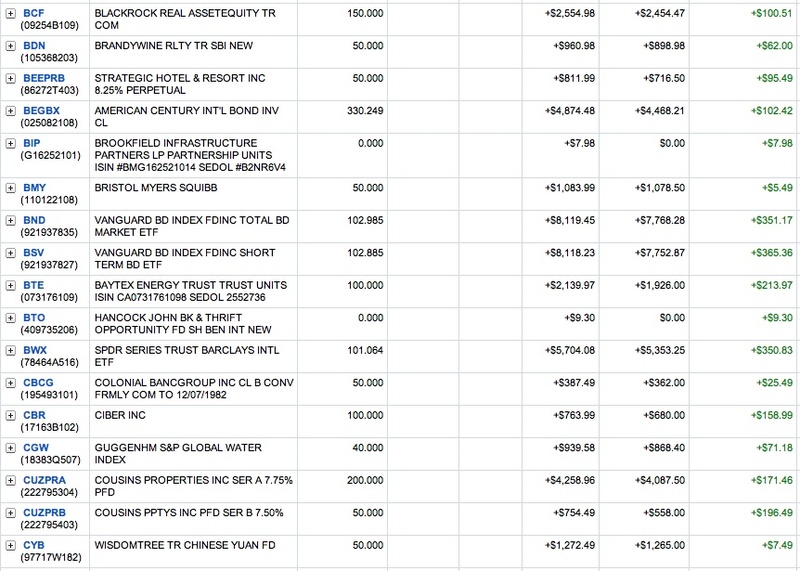 As shown by the recent trading activity on those fixed coupon bonds, their YTM is less than 2%. So why fool with MOL with its 2% minimum coupon and a 19% maximum limit? I pick up more yield than the fixed coupon Citigroup senior notes and at least have the potential to earn anywhere from the 2% minimum coupon to 19%. While the future is uncertain, there is at least a reasonable possibility that gold will be above $1,777.35 on 11/19/12 which would trigger an increase in the minimum 2% coupon. I will also make a small profit at maturity assuming Citigroup pays off the note. I am now past my comfort level in these Citigroup Funding "principal protected" notes maturing in 2014. I currently own $10,000 in principal amount. Why is the OG uncomfortable? It must be remembered that the OG is naturally riddled with anxiety and in need of a constant infusion of chill pills. And, it does not help that the OG knows that "principal protected" does not mean safe. It only means that I will receive $1,000 per note provided Citigroup survives to pay the note at maturity, just like any other unsecured senior note. In each case, the investor needs to review the prospectus, and calculate the Starting Value for the current annual coupon period and the Maximum Level, as shown above for MOL. It is also important to monitor the health of Citigroup which requires a review of both its quarterly earnings report and major news events. An article in this week's Barrons ranks state debt by combining debt and unfunded pension liabilities relative to each state's GDP. I would rank the debt of California, Illinois, and New Jersey near the bottom using mostly my judgment. Using the Barron's criteria, Illinois was second from the bottom, but Connecticut's debt was the least safe. Tennessee was ranked third, and I would expect my state to be the near the top. Tennessee's debt plus its pension liability was 1.5% of its GDP, while Connecticut's ratio was 17.1%. New Jersey's debt was ranked at #42 and California at #34. I was surprised by Kentucky being ranked near the bottom. Municipal bond investors need to pay more attention to unfunded pension liabilities when evaluating the safety of longer term bonds. For amusement, the OG will frequently read comments made by WSJ readers, and it is not difficult to spot the TBs (see, e.g. WSJ). One person who left a comment argues that the government's budget problems originate from the Democrats showering free money on minorities. He does not say African Americans or anything that could easily be pegged as overtly racist. He is referring to food stamps and welfare. Those angry white men, along with assorted wingnuts, will eventually cause the GOP to become a minority party bordering on irrelevance. Give it twenty years at the most. Do racists now vote for Democrats or Republicans? In the south, they were mostly voting for Democrats before that party started to support the civil rights legislation in the 1960s. Then, as part of the GOP's Southern Strategy, they changed their allegiance to the republican party and have never left. The Southern Strategy has been a great success for the GOP so far at least. As pointed out by Michael Barone in an article published yesterday by the WSJ, the GOP is now receiving 60%-69% of its electoral votes from the South. Barone points out that noncollege whites have been declining as a percentage of the electorate. Noncollege whites who are also evangelicals supplied 42% of McCain's votes in the last election. When that is kept in mind, the recent comment by Romney that no one has asked to see his birth certificate can not be construed as a bad joke, but as a sop to those core GOP votes who view a black President as foreign, someone who does not share their "American" values as Sarah was so fond of saying during the last Presidential election. It is also not difficult to convince this crowd that the Vietnam War (LBJ-D) or the Second Iraq War (Bush Jr.-R) was in the nation's national interest. And they are also subject to easy manipulation with false campaign advertisements. It is impossible to reason with the angry caucasians who feel that their country is slipping away from them. They do not recognize their own dependence on the government and are quick to stereotype the poor as non-working, who vote for Democrats in exchange for all of that free welfare and food stamp money. The government could save far more money by eliminating all federal subsidies for Medicare, so that those angry middle age white men can support their parents as they slide into poverty. Or, perhaps, those angry whites, who blame the poor for everything including the Near Depression. Ideology and Facts: Coexistence Not Allowed, could be denied extended unemployment compensation when they are fired or laid off during a recession and are unable to find a job. No, the racist will not focus on their government benefits, or those received by their family members, and will instead focus entirely on the programs intended for the poor, particularly the non-white poor who fit within their stereotypes and racist perceptions. What do they see in their mind's eye? An overweight black woman standing in line for a welfare check with ten babies by eight different fathers in tow, using one of her eighty aliases to defraud white people of their hard earned tax dollars. The repetitive welfare queen's statements made by Ronald Reagan, which blew way out of proportion a case of welfare fraud involving $8,000, NYT, were intended for this audience. The Willie Horton ads had the same purpose, as did the ads run against Harold Ford by the RNC in Tennessee when that black man ran against Corker for the U.S. Senate. Harold call me!-YouTube; New York Times Ann Coulter demonstrated their perspective on events when she said, in her usual incendiary way, that the mortgage crisis originated from giving loans based on a persons ability to hit a jump shot. HUMAN EVENTS All of the foregoing are mere extensions of the GOP's Southern Strategy, as they successfully took it national. I have not mentioned two major sources of the government's current budget problems: (1) the trillion dollars sunk into Bush's Iraq War and (2) the trillions lost in the Bush Tax cuts that primarily benefited a few old white people, the major source of the GOP's campaign contributions, rather than those middle class white men who may still believe that those cuts were intended to help them. Both of the foregoing drains on the government's finances were supported by the TBs en masse. I thought that I would just focus on one program which draws their collective ire-Food Stamps. The number of recipients will start to trend down once the economy more fully recovers from the Near Depression. Some of the increased costs are due to higher benefits originating from Obama's 2009 stimulus that are set to expire at the end of 2013. CBO | The Supplemental Nutrition Assistance Program The CBO estimates that about 20% of the increased cost is due to those temporary benefit increases. Arguably, those additional benefits should expire at the end of this year. I would agree with the republicans on that issue. Over the weekend, I listened to a speech given by Eisenhower at the GOP convention in 1956. The speech was replayed on CSPAN. I was impressed by it. I was also reminded in stark fashion how much the GOP has changed for the worst since that time. I would have had no difficulty voting for Eisenhower. The Modern GOP is no longer a conservative party but a reactionary one trying to appease the fringe elements in our society that have always existed in large numbers. It has retrogressed to a 19th Century parody of itself at it re-adopts a slightly more modern version of Social Darwinism that was fashionable, among the less enlightened set, over 120 years ago. While watching the season finale of the HBO series "Newsroom", written by Aaron Sorkin, a newscast ends with a criticism of the Modern Day GOP that could have been found in this blog, including the use of the phrase "American Taliban" to describe an important GOP voting bloc. I had never heard or seen a similar use of that phrase outside of this blog. I started using that phrase in 2009, usually in the context of stating that the GOP has been kidnapped by the American Taliban movement. If the OG was not nervous about the market, I would have bought 100 shares. One thing is for certain. A 50 share purchase is not going to help or hurt me, but creates the psychologically beneficial impression that I am doing something rather than just sitting on my behind doing nothing which is actually what I am doing now. This new ETF includes technology and telecommunications companies that pay dividends. The weighting will be about 80% in technology companies and 20% in telecommunications. For inclusion, the company must have at least a .5% yield and must have paid a regular common within the past 12 months. That low minimum qualifies Oracle for inclusion. 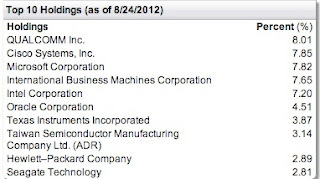 ORCL: 31.83 -0.12 (-0.38%) Apple will be eligible for inclusion in the index next year. This ETF is discussed in a Barrons' article. The author of that article claims that this index currently has a 3.3% yield. To arrive at the fund's yield, it would be necessary to subtract the expense ratio. According to the Prospectus at page 9, the fund anticipates paying quarterly dividends. The expense ratio is .5%. 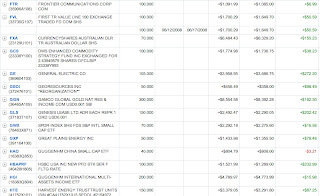 The fund had 59 holdings as of 8/25/12. I decided to nibble at this one as several large technology companies have recently instituted dividends and/or started to increase existing payouts significantly (e.g. Cisco). Many of them certainly have the cash and capacity to increase dividends at a more rapid rate than companies in other sectors. Unfortunately, a lot of the cash is held by overseas subsidiaries of these companies, and is consequently not available for dividends unless the corporation wants to pay a large tax to bring funds back to the U.S. If Romney is elected, I would expect a reduction in corporate tax rates and possibly a tax holiday for repatriation of those funds. I am not making a policy argument here. If the GOP wins, I suspect that large tech firms will be able to bring money back to the U.S. that can be used to accelerate their dividend increases. The plan will be sold to the public as a measure to create jobs, and many gullible people will accept that line of B.S. without questioning it. Under the deal, HCBK shareholders will receive consideration valued at .08403 M& T shares in the form of M & T stock or in cash. I have a generally favorable opinion about M & T. I The offer is subject to proration, so that no more than 60% of the aggregate consideration can be paid in M & T stock. Since I only own 111+ shares, I may end up selling this lot just to avoid the proration. There are also many positives for M & T. It navigated the Near Depression period better than most banks and has significantly expanded its geographic footprint by acquiring other institutions that faltered, including Wilmington Trust. As of 6/30/2012, the efficiency ratio was good at 56.86%; nonaccrual loans were acceptable at 1.54% of total loans; and the average return on tangible assets for the last quarter was 1.3%. SEC Filed Press Release Under the circumstances, the net interest margin was okay at 3.74%, basically unchanged from a year ago. Before HCBK became fell victim of the Fed's Jihad Against the Saving Class, the stock was trading over $16 per share back in October 2008. HCBK Interactive Chart This bank was highly dependent on outside funding sources and home mortgages. With the decline in rates, Hudson's net interest margin was negatively impacted far more than other regional banks that I own for those two reasons. While it is just my personal opinion, I believe HCBK shareholders would be better off long term rejecting the MTB offer and simply wait for a more opportune interest rate environment before selling out. By selling out now, they in effect value the bank at 2003 prices. (see long term chart of HCBK; and WSJ) For that reason, I will vote against the merger. Hospitals are breeding grounds for all kind deadly bugs. I recall one incident a few years ago when my father caught a drug resistant infection soon after being admitted to a Nashville hospital. After being told about that infection, a cleaning person came into the room, with a bucket of dirty water, dipped a clearly dirty mop into that bucket and mopped the floor. An article in the WSJ disclosed how six patients, probably more, died at the National Institute of Health's "elite" hospital in Bethesda, Md. soon after one patient was transferred to that hospital with a drug resistant Klebsiella pneumonia. The hospital only had 243 beds and that patient was put in isolation upon arrival. Royce Micro-Cap Trust (own) declared a $.12 per share quarterly dividend, with a 9/4/12 ex dividend date. Royce Value Trust (own) declared a $.18 per share quarterly dividend, with a 9/4/12 ex dividend date. First Opportunity Fund (own) reported a net asset value per share of $9.49 as of 8/24/2012. CEFA Based on a closing market price of $7.15 that day, the discount was -24.66. I received less than the foregoing on 8/23, so it varies from day to day. 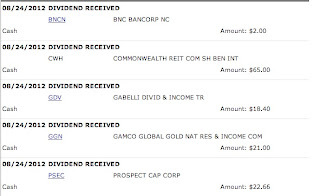 The foregoing snapshot includes two monthly distributions from CEFs (GDV and GGN); one monthly distribution from a BDC where I recently quit reinvesting the dividend (PSEC); one quarterly dividend from a REIT (CWH); and a quarterly dividend from a LT holding (BNCN). And, does anyone know of a single successful new consumer product originating from HP over the past decade? How many employees does that company have anyway, something like 350,000 after the recent job cuts. Out of that many employees, why can't HP find one or 10 who would invent the next big consumer gadget? Why are all of those products coming from Apple? While HP may successfully turn around its businesses over the course of several years, there is no sign yet of a turnaround based on the latest earnings report. SEC Filed Press Release Anyone purchasing HP stock, even after its recent shellacking to a seven year low, will have to be extremely patient and have a multi-year time horizon. Even with that patience and long term time horizon, it is far from clear that the investor will be rewarded to any significant decree. HP could easily fail. I would not assume another IBM type turnaround. True Believers live in a world of their reality creations. A GOP judge from Texas warned last week that a civil war could erupt if Obama is re-elected this November. CNN.com This deep thinker believes that Obama will give away U.S. sovereignty to the United Nations. And when those United Nations tanks roll into Lubbock, he will stand in front of those tanks, along with the sheriff and the Texas militia, and fight just like the patriots did at Concord and Lexington. It is not possible to have a rational and factual discussion with TBs who live in a world of their own reality creations or creations given to them for those unable to form their own. Their opinions, even the most outlandish and bizarre ones, are viewed as facts that are not subject to dispute. The depletion issue is a major issue with royalty trusts, as explained by Jason Zweig in his WSJ column. Royalty trusts include BP Prudhoe Bay Royalty Trust (BPT) and the San Juan Basin Royalty Trust (SJT) which cut its dividend last week. The Yorkville ETF owns both of those royalty trusts. A list of Royalty Trusts can be found at Bloomberg. I would prefer that the fund just sell SJT and replace it with a non-royalty trust name. The fund has paid two quarterly distributions to date, both a tad over 40 cents per share. Yorkville High Income MLP ETF Distributions Assuming a continuation of that rate, the yield would be close to 8.53% at a total cost of $18.75. The first distribution was classified as a 100% return of capital. IRS Form 8937.pdf It appears to me that the fund is receiving distributions from its holdings sufficient to support that dividend or close to it. I have not performed the actual calculation, but the holdings are high yielding MLPs paying mostly between 7% and 13%. I would not call that kind of return of capital as destructive. A destructive return of capital is when the fund simply returns the investors capital since it has not earned the dividend either by the receipt of distributions from its holdings or by realized gains from those investments. In that later case, the fund is depleting its asset base with the return of capital to the extent it is paid in cash to its shareholders. With the ETF ownership structure for MLPs, I avoid the considerable hassles associated with tax return preparation, and I do not face the creditor risk issue inherent in the ETN form of ownership. There is a downside trade-off that some investors may not want to pay. The ETF has to pay taxes and to hold reserves against potential tax obligations. WSJ Motley Fool (see prospectus at pages 5-6). That will cause underperformance compared to the ETN form of owning the same securities. So, it is really just a question of picking your poison. I am not going to fool again with the tax return headaches associated with MLPs, and this requires me to own them in a fund that avoids the K-1 hassle entirely. And, I will take the lower performance due to taxes with the ETF structure over the credit risk of the issuer that exists with the ETN form of ownership. If the ETN issuer becomes bankrupt, the owners of that ETN are in the same position as all other unsecured creditors, maybe looking forward way, way down the line of receiving 20 cents on the dollar. If I owned a Lehman senior unsecured note, and fortunately I did not, I may not live long enough to receive that 20 cents. I view this investment to be a short term investment, not likely to be held for more than two years. The goal is to exit the position for any profit on the shares before the return of capital adjustment, thereby harvesting several dividend payments. I may sell the higher cost 50 share lot when and if the price falls in the $19.3-$19.5 range. 2. AGY Holdings (own 1 senior secured second lien 2014 bond: Junk Bond Ladder Basket Strategy): AGY reported a second quarter loss of $4.8M on revenues of $46.5M. The loss for the 2011 second quarter was higher at $6.1M. SEC Filed PRESS RELEASE AGY U.S. had net cash of just $.6M. Long term debt stood at $199.5M. Total liquidity for AGY U.S., which includes borrowings available under its bank credit facility, stood at $18.7M. As of 6/30/12, the balance sheet showed $28.168M in inventories and another $155.926M in property, plant and equipment. The AGY Asia debt is reported as non-recourse. The amount of the first lien debt was reported at $27.655M. I own the senior secured 2014 note which is described in note 8, at page 10, of the last filed Form 10-Q. That note is traded infrequently and the last trades were at more than a 50% discount to par value, which indicates considerable skepticism about AGY's ability to pay off the note at maturity. It appears more likely that investors are attempting to price a potential recovery after a default at that price level. AGY is certainly one of my more problematic holdings in the junk bond basket strategy. 3. EPA Emissions Rules for Coal Plants Struck Down: In a 2 to 1 decision, the U.S. Court of Appeals for the District of Columbia struck down the EPA's emissions rules for coal plants. Those rules required utilities to spend billions to retrofit existing plants. A number of plants were been shutdown since it was not economical to install more pollution control devices. As noted in this article published by Fox Business, it is unclear how this ruling will impact Edison Mission. If the 2-1 decision is affirmed by the full D.C. Circuit sitting en banc, with no appeal granted to the Supreme Court, then it could relieve some liquidity strains on EME. Possibly, some costly retrofits could be delayed on those plants that EME had decided to keep. The prices for all of these bonds have flatlined generally in a 54-55 range. When bonds flatline, regardless of maturity and the coupon, this indicates to me that investors believe that all of them will soon be in the same boat after a bankruptcy filing. Since the 2013 maturity is priced the same as one maturing in 2027, both at 54-55, investors are virtually certain that the bankruptcy filing will occur before the 2013 bond matures. Investors are simply attempting to price the value of all senior unsecured bonds after the bankruptcy restructuring.